Knitting in Pembrokeshire: Life-Saving | Knit Like You Mean It. 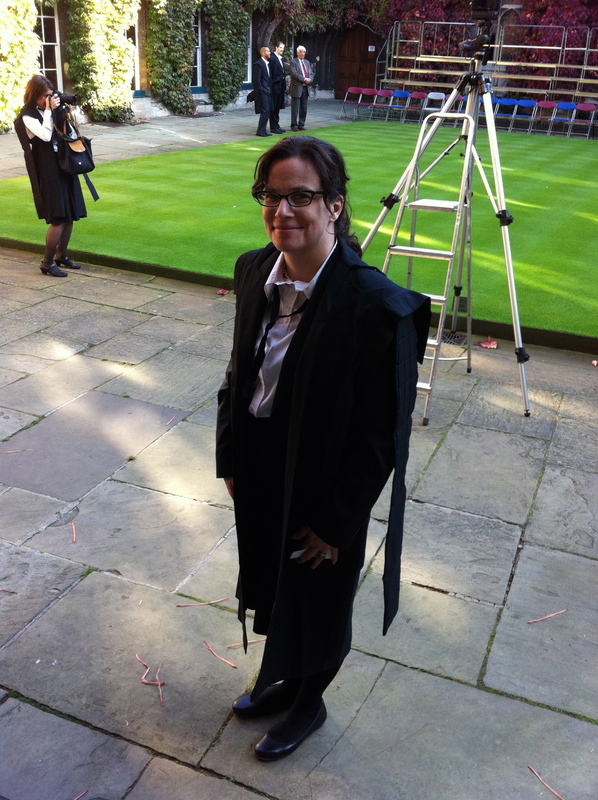 This one's for the family members: here I am in my subfusc: tie, robe with streamers, mortarboard in hand, etc. More excitingly, I was in Wales last weekend, knitting with the fabulous Brenda Dayne and the brilliant Amy Singer. 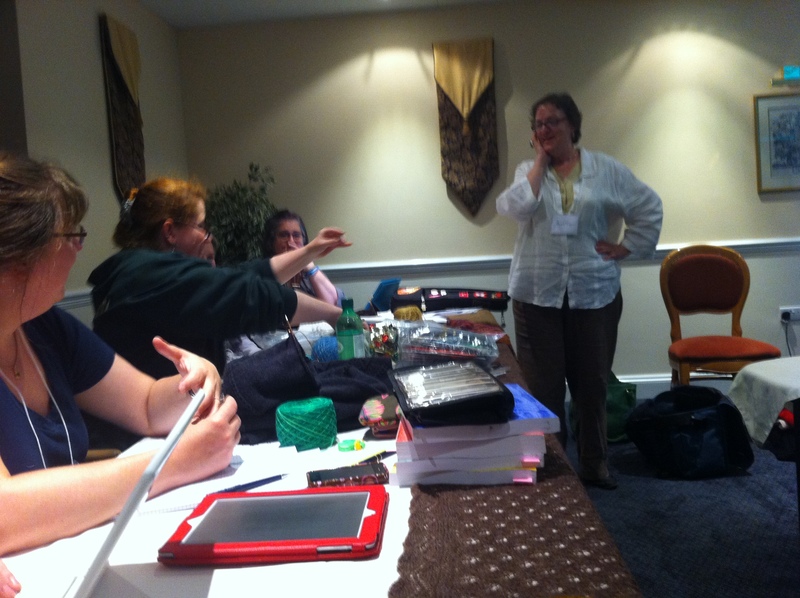 They put together a retreat on designing with lace that was inspiring and enlightening, as well as a whole lot of fun. The group was small by design, so that we each got a fair amount of attention from Amy and Brenda, and also got to know each other. First, of course, I must tell you about Matriculation. This is an ancient required ceremony at the University of Oxford, in which new students dress up in funny clothes and wait for several hours for two Latin phrases to be spoken (and then for a group photo to be taken back at their college). I signed up for Plug+Play Pembrokeshire long before I had heard of Matriculation, and as it turns out one is required to be there. Required. As in, my group of freshers waited 45 minutes at our college while they woke up and dressed the one guy who didn’t show. So I had to arrange with Brenda and Amy to come a bit late. With all that, want to know a secret? I was lucky that slacker they routed out of bed wasn’t me. 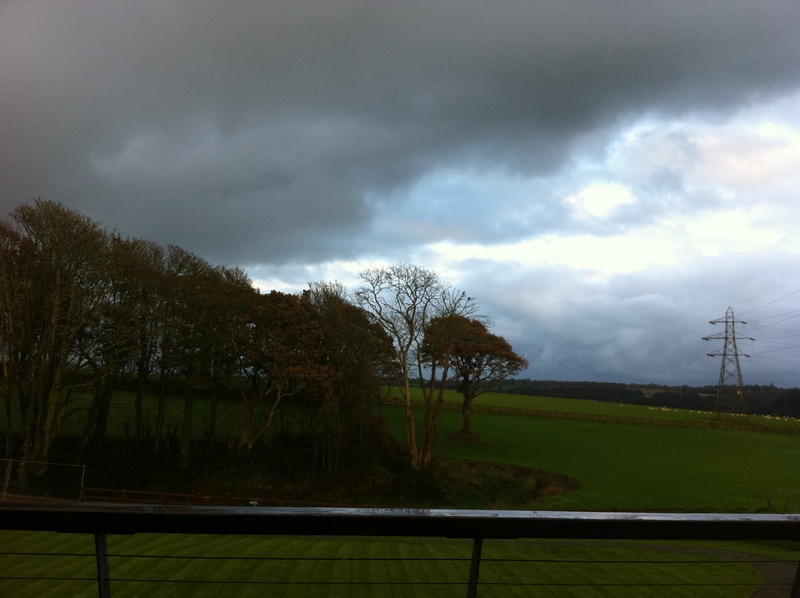 Clouds in Wales: is there anything prettier? Brenda is sympathetic, listening to a knitter's tale of woe during Today's Sweater. All of this is to explain to you all how I got to Wales with no knitting needles. The goody bag was providing us with everything but needles, and I. Came. Without. Them. So freaking embarrassing. But Brenda and Amy were lovely about this, and of course folks were willing to loan me needles. Even better, I got to borrow one of Amy’s Symfonie Dreamz Interchangeables (Mr. Trask, take note: the 5th wedding anniversary gift is traditionally wood). Still, not a move I want to repeat any time soon. Luckily, Jeni of Fyberspates brought some needles to our teeny-tiny marketplace on Sunday along with her gorgeous yarn. This brings me to the stash-enhancement portion of the weekend: between the goody bag and the marketplace, I have tripled my stash. Anzula, Alisha Goes Around, and Indigodragonfly all contributed to our goody bags (as did Soak and the amazing Knitifacts). Plus, I might just have bought some yarn both from Jeni and from Nimu Yarns, about whom I hadn’t heard before. 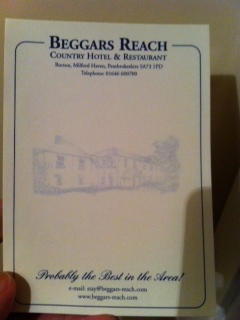 "Beggars Reach: Probably the Best in the Area!" Other than the continuous humiliation of having arrived late and unprepared, the retreat was glorious. Both Amy and Brenda are excellent teachers, and the group was both friendly and encouraging. People came up with some amazing lace designs. Plus, on Saturday night, we got to see Today’s Sweater live! Brenda did some of her sweater show-and-tell, and encouraged us to do the same. Catherine (who also has much better pictures of the weekend than I do) brought an amazing lace baby shawl that her mother-in-law made when Catherine’s daughter was born (she made one for each of the grandchildren, and three of the great-grandchildren), and then Catherine’s own version of the shawl, which was three-color and gorgeous. Josie showed us her version of double-knitting. Someone (Vandy?) showed us her stunning finished Lalique jacket. And Sally showed us an amazing baby coverall that she designed for a contest (using up several days of vacation time in the process) 20 years ago. I hung back, because I had not packed my Today’s Sweater, either. Sigh. 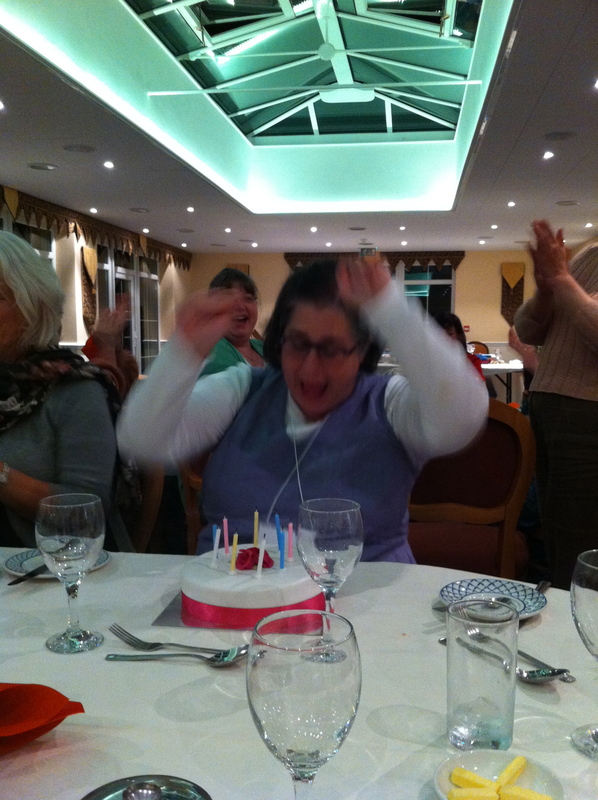 Amy celebrates after blowing out all the candles on her birthday cake. Other highlights included incredible food; much discussion of Doctor Who, Torchwood, and everything Joss Whedon has ever written; an early celebration of Amy’s birthday; and a group of us watching Downton Abbey on Sunday night (with Tina explaining to us that Violet, Dowager Countess of Grantham, was the living image of her grandmother). Finally, if you’re really curious about what went on, below is a fabulous video Laurie made of our time in Wales. Enjoy! And, commenters, do tell me about the most embarrassing “I forgot” moment of your lives, just so I know I’m not alone. Oh joy! I actually woke up this morning (way too early) and was thinking about you and wondering if my computer was broken as I hadn’t had a chance to live vicarously hearing your adventures abroad. So glad to hear from you and about you and laugh with you (not at yet) this from the woman who when we went on a rare visit when the kids were little packed for everyone and forgot to pack for myself at a time we were too broke to do anything but wear dirty clothes for a few days. There’s no convention with regards to which side of the pavement (or “footpath” if you’re in Ireland) you walk on. Walking around is like playing a very polite game of chicken – who will give ground first? Personally I pick the side where my right foot, which I broke a few years ago, isn’t in danger of rolling off the curb (that’s how I broke it). Sounds like a wonderful retreat, and a fabulous way to quickly get into the UK knittig scene. I wanted to weep as I enjoyed this post. Second, in envy of the time you spent with Dayne and Singer. I do not know either of them, but I love them both. I remember when I first heard Brenda talk about the retreat on Cast On. I wanted to be there more than I can say here . . . it would take volumes. By the way, did you know Amy Singer’s mother used to be my boss? I still remember the sparkle in her mom’s (or should I say mum’s?) eyes as she told me about her daughter getting ready to publish her first knitting book. It was during my job interview with her. At the time, I hadn’t taken knitting back up yet, and I remember telling myself that someday I had to get back to it. Thank goodness I did . . . and now, Amy’s first book sits on my shelf in fond remembrance of my first hearing about her. Beautifully written post. Nice video, too. Lee! How cool that you knew Amy’s mother. Amy is so wonderful – very smart, very friendly. So good to hear from you, too, O Gluten Free Friend. 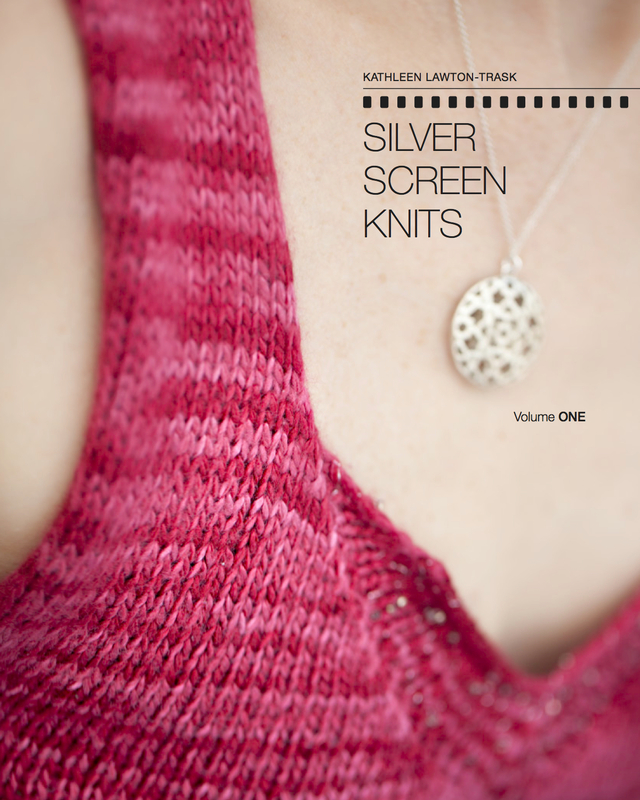 I just stumbled across your blog and thought I would say hello as I am a fellow knitter and also live in Oxford. If you haven’t yet found them, the Bluestockings are a lovely knitting group that meet on Wednesday evenings at the Royal Oak. If you need showing around or similar let me know, always glad to meet another knitter! Thank you so much, Amy! Lovely to meet an Oxford knitter. Do you go to the Bluestockings meetings? It would be fun to meet up! I try to go when I can but it coincides with my weekly circuit training so I don’t get there very often. They are friendly though and new people show up all the time. It’s from 5:30-8ish every wednesday evening. They also have a group on ravelry. I love your subfusc – that is one of my favorite photos of you. And I love the fact that you made it to Wales for lots of great knitting. Oh, and don’t knit in the beanbag chair. Your back will never be the same. Amy – thanks for the info! Turns out they meet just a few blocks from our flat, so I’ll be dropping in next week or the one following. Lynn – we opted for a futon sofa instead of a beanbag chair, so my back is (sort of) saved. Wonderful video! Looks like a lovely time.